Powers/Abilities: Stencil is a mutant with the ability to drain mental energy from others. She can absorb a person's entire consciousness into herself, but must then keep that identity under control. She possesses at least three different personalities, and is said to be too fragile to control any more. Stencil can only access her powers when her original personality is in control. The knowledge she has gained includes a great deal of military know-how, making Stencil a dangerous soldier, always armed with a machine gun. 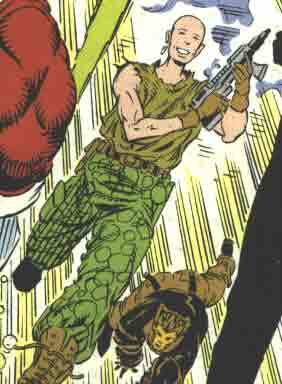 History: (Soviet Super-Soldiers#1) - Stencil hid out in a farmhouse in the Ukraine with other members of Blind Faith's underground mutant cell, but they were discovered by the cybernetic soldier Firefox. Stencil escaped with Darkstar through her teleporation powers, but the others were killed. Ursa Major, Vanguard, Darkstar, Blind Faith, Stencil and Sibercat hid out in an apartment in Novosibirsk, Siberia, but were found by the military. Blind Faith kept Stencil from absorbing the soldiers' minds into herself. After a skirmish with them, they teleported away using Darkstar's powers. With Firefox and the military decimating the safehouse system, they sought out the Underground Mutant Safe-System on the Black Sea, to convince them to abandon the safehouse system and join them in fighting back. However, the safehouse was again found by Firefox, and all of their mutant allies were slain. They fought back against Firefox and his men, and Stencil absorbed several of them into herself. Vanguard finally defeated Firefox, and Blind Faith forced him to admit the the military's plans for mutant genocide to the press. The six heroes hid out in another Siberian safehouse as they prepared to fight back. Stencil had put on a wig and dress as one of her female identities, Maria, was now in control. However, Sibercat stole the wig from her, saying that last time she had become Maria, she turned into Colonel Krychev in mid-sentence, and "he" blamed them for putting her in a dress and wig. Blind Faith christianed the six freedom fighters the "Exiles," and stated their goal to be the overthrowing of the Russian government. (Starblast#1) - Stencil and the others-- now calling themselves "Siberforce"-- witnessed the effects of the Starblasters' Moon Thruster on Earth's moon. Stencil was strictly of the opinion that the moon looked lovely, but Darkstar and Vanguard set off to investigate. Stencil is essentially a Russian version of Legion, who was also victimized by the multiple psyches in his mind.